Dr. Ronald Rensink is an associate professor in the Departments of Psychology and Computer Science. 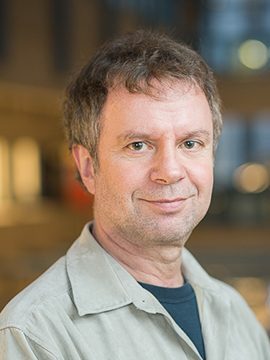 He is director of the UBC Visual Cognition Lab and an integral part of the Vancouver Institute for Visual Analytics (VIVA), and the Cognitive Systems program. His primary interests are in computational/human vision and data visualization. Research interests include visual cognition; visual attention; consciousness; information visualization; visual analytics. Rensink RA (2018). To have seen or not to have seen: A look at Rensink, O'Regan, & Clark (1997). Perspectives on Psychological Science, 13: 230-235. Ueda Y, Chen L, Kopecky J, Cramer ES, Rensink RA, Meyer DE, Kitayama S, and Saiki J. (2018). Cultural differences in visual search for geometric figures. Cognitive Science, 42(1): 286-310. doi: 10.1111/cogs.12490. Rensink RA. (2017) The nature of correlation perception in scatterplots. Psychonomic Bulletin & Review, 24: 776-797. doi: 10.3758/s13423-016-1174-7. Cramer ES, Dusko, MJ, and Rensink RA. (2016). Group-level differences in visual search asymmetry. Attention, Perception and Psychophysics, 78:1585-1602. Kuhn G, and Rensink RA. (2016). The Vanishing Ball Illusion: A new perspective on the perception of dynamic events. Cognition, 148: 64-70. Rensink RA, and Kuhn, G. (2015). The possibility of a science of magic. Frontiers in Psychology, 6, 1576, doi: 10.3389/fpsyg.2015.01576. Olson JA, Amlani AA, Raz A, and Rensink RA. (2015). Influencing choice without awareness. Consciousness and Cognition, 37: 225-236:doi:10.1016/j.concog.2015.01.004. Rensink RA. (2015). Preparing undergraduates for visual analytics. IEEE Computer Graphics and Applications, 35 (2), March/April. pp. 16-20. Rensink RA (2014). On the Prospects for a Science of Visualization. In W. Huang (Ed. ), Handbook of Human Centric Visualization: Theories, Methodologies, and Case Studies. New York: Springer. pp. 147-175. Rensink RA (2013). Perception and Attention. In D. Reisberg (ed). Oxford Handbook of Cognitive Psychology. Oxford: University Press. pp. 97-116. Gauchou HL, Rensink RA, and Fels S (2012). Expression of nonconscious knowledge by ideomotor actions. Consciousness and Cognition, 21: 976-982. Olson JA, Amlani AA, and Rensink RA (2012). Perceptual and cognitive characteristics of common playing cards. Perception, 41: 268-286. Rensink RA (2011). The Management of Visual Attention in Graphic Displays. In C. Roda (ed. ), Human Attention in Digital Environments. (40 pages) Cambridge: University Press. Rensink RA, and Baldridge G (2010). The perception of correlation in scatterplots. Computer Graphics Forum, 29: 1203-1210. Kuhn G, Amlani AA, and Rensink RA (2008). Towards a science of magic. Trends in Cognitive Sciences, 12: 349-354. Rensink RA (2004). Visual sensing without seeing. Psychological Science, 15: 27-32. Rensink RA, and Cavanagh P (2004). Influence of cast shadows on visual search. Perception, 33: 1339-1358. Rensink RA, O'Regan JK, and Clark JJ (1997). To see or not to see: The need for attention to perceive changes in scenes. Psychological Science, 8: 368-373.